­Tulsi Parikh is a first year PhD student at the University of Cambridge researching votive assemblages across sites in Archaic Greece. She undertook her Masters in Classical Art and Archaeology and her undergraduate degree in French and Modern Greek at King’s College London. 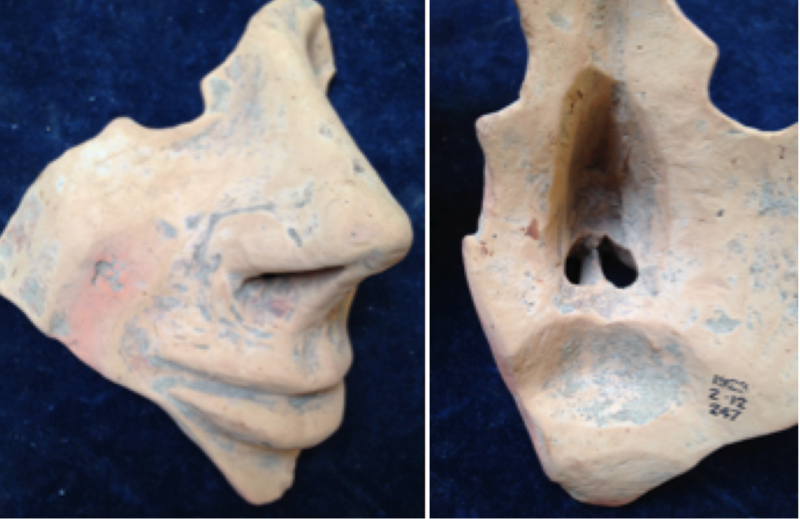 Between 1906 and 1910, the British School at Athens uncovered at least six hundred and three masks at the Artemis Orthia site, which they calculated according to the number of noses they had identified. In Greece, such a large collection of votive masks is so far completely unique to Sparta and the lack of specific evidence associated with their dedication means that they remain something of a mystery. The captivating appearance of many of the masks initially raised questions in my mind concerning when and why they might have been worn. Closer examination, however, (particularly through access to fragments in the British Museum collection) revealed that the wearability of the masks in itself poses problems and this is, therefore, the line of inquiry I shall pursue here. Were the masks actually worn as part of some ritual activity before they were dedicated? Or were they produced for the purpose of dedication alone? Dickins makes valuable observations based on the facial features of the masks, subsequently dividing them into seven categories: Old Women, Caricatures, Portraits, Warriors, Youths, Gorgons and Satyrs. 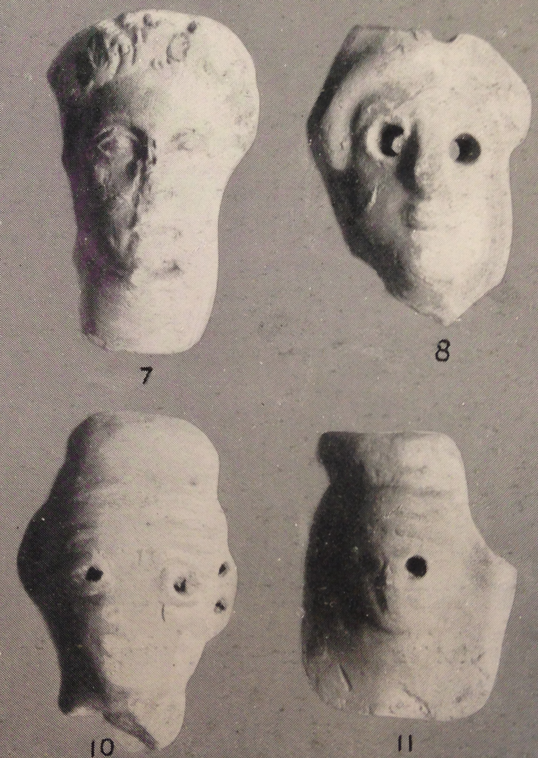 Left: Grotesque mask, termed ‘Old Woman’ by Dickins (1929: pl.47). Centre: Grotesque mask, termed ‘Caricature’ by Dickins (1929: pl.61). 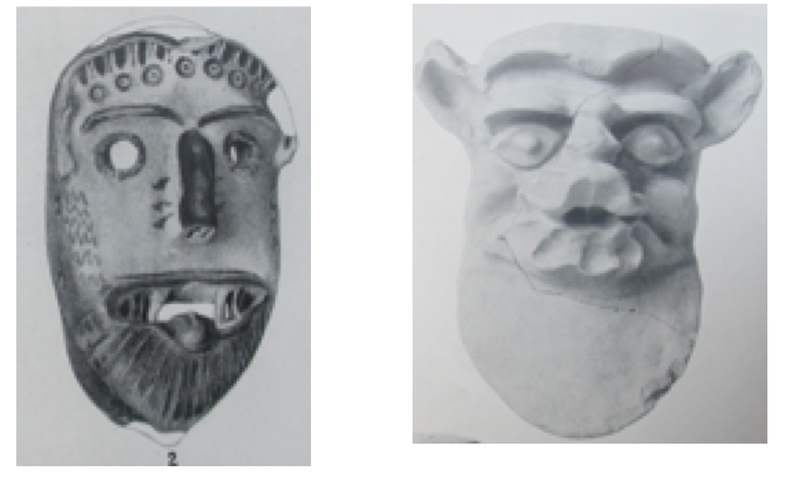 Right: Drawing representation of grotesque mask, termed ‘Portrait’ by Dickins (1929: pl.55). Left: Warrior (Dickins 1929: pl.52). Right: Youth (Dickins 1929: pl.51). Left: Gorgon (Dickins 1929: pl.56). Right: Satyr (Dickins 1929: pl.62). It is helpful when considering their function as votives and ritual objects, however, to think about the masks not only in terms of what we see on the front, as offered by Dickens’ typology, but also their practical features, often determined by considering the underside of the mask. How concave is it? Is there enough space for the nose of the wearer? Have holes been made in order for the wearer to be able to breathe and see? Would the mask fit on a human face? After all, the obvious function of a mask is a disguise for the face to change or conceal the wearer’s identity. In spite of this, however, very few of the Spartan masks seem to be wearable. The dedication of masks spans around five centuries, beginning in the seventh century BC. Those that do have the characteristics of wearable masks are generally the earliest ones (e.g. masks 1, 2 and 3) and are mostly grotesque in nature, with the exception of a few of the Youths and Satyrs. From the sixth century onwards, however, the majority of masks are too small and/or too flat to be worn (e.g. masks 4 and 6) and many do not have pierced eyes, nose or mouth (e.g. masks 5 and 7). These comprise most of the non-grotesque types (the Youths and Warriors), the mythological masks of Gorgons and Satyrs and the rest of the Grotesques. The dedication of life-size and near life-size masks comes to an end in the fifth century, but there is also a number of miniature terracotta masks dedicated at the sanctuary in the proceeding two centuries, which measure approximately six centimetres in length. In order to explain the phenomenon of dedicating masks that would have been difficult or impossible to wear, scholars have suggested that the masks were held in front of the face (Carter 1987). This is plausible, but some masks were clearly designed to fit a face; why not make them all flat if they were only to be held in front of the face? 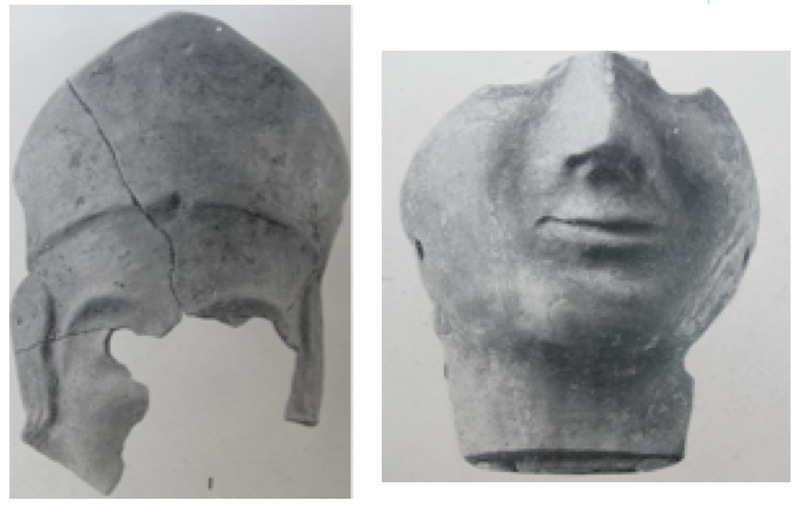 It has also been suggested that the terracotta masks are replicas of original masks of wood, leather or linen and thus the votive masks vary in their accuracy to these originals (Bosanquet 1906). This theory is again plausible since Hesychius of Alexandria (a Greek grammarian writing in the fifth century AD) mentions dances in honour of Artemis during which wooden masks were worn (Hesychius s.v. κυριττοί). The worshipper may have wanted to dedicate something less perishable and more permanent at the sanctuary. However, as a source from the fifth century AD, some seven hundred years after the last attested mask at the sanctuary, there is no certainty in this assumption either. I do not think it should be ruled out that some of the earlier terracotta masks were worn, whereas the later ones were not and may simply have been dedicated as a symbol of the idea of masking in a ritual activity associated with the cult. This may be a result of a change in ritual activity or dedicatory custom during the beginning of the sixth century, at which point the masks seem to lose many of their qualities as wearable masks and there appears to be an increase in the non-grotesque type. What is clear is that the presence of masks at the sanctuary for such an extensive period of time highlights their continued importance to the worshipper as a symbol in the cult of Artemis Orthia, even after the dedication of life-size masks had diminished and eventually disappeared. The varying levels of wearability, on the other hand, raise questions concerning their function as votives. If the majority of masks were not worn or used in a ritual practice before being placed in the sanctuary, then what was the reason for their dedication? What did they symbolise in their role as votives displayed at the sanctuary? And with what religious ideas or practices were they associated? In order to shed some light on these issues, it is necessary to consider contemporary sources (other finds at the sanctuary or Spartan lyric poetry, for example) as well as evidence of masking elsewhere in Greece and cross culturally. My research on these puzzling votives has led me to interpretations of the masks as symbols of transformation and concealment but also as memories of past dedicants and representations of identity. Of course, however, their significance remains a matter of conjecture and is therefore still very much open to new debate.